Bacon. Bacon! BACON! Just saying the word brings me utter happiness. Faced with a platter of perfectly cooked bacon strips is sheer nirvana. Never mind that you might end up in heaven soon enough. Bacon is worth every single calorie. And Swiss Gourmet delivers excellently. Breakfast in bed like this? Makes you think you’ve died and gone to heaven. 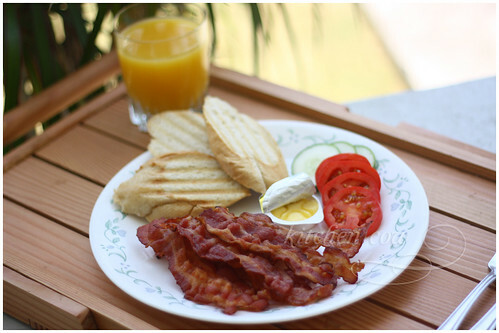 Cooked to a nice even crisp, Swiss Gourmet’s Smoked Bacon is happiness on a plate. Lean and well-seasoned, the light smokiness resonates well. Aside from the Smoked Bacon, they also have Bacon Ham—a happy cross between ham and bacon. It comes in rounds instead of strips, making it perfect for sandwiches. If you’re looking to make your own bacon cheeseburgers, Swiss Gourmet’s Bacon Ham is perfect for it. Tip though, you may want to snip small cuts alongside the outer ring, to minimize the bacon’s curling. Hungarian to the front, Schublig at the back, happiness all over. Swiss Gourmet also has sausages. I got to try the Schublig and Hungarian Sausages—two of my favorites. The insides of these sausages are ground fine, with miniscule fat particles. Both are bursting with flavor, quite literally. The casing is also on the thick side, creating a resilient crust that’s wonderful to bite into. 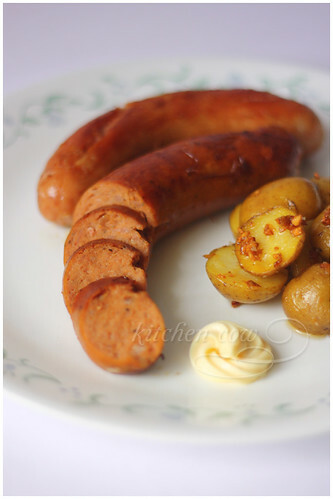 For people who live spicy food, the Hungarian sausage is wonderfully spicy, spicier than some Hungarian sausages I’ve tried (e.g. Santis) so be ready to have some bread to munch on. 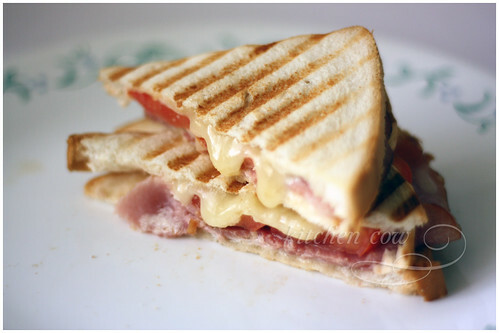 Panini with Farmer’s Ham, tomatoes and monterey jack cheese. Aside from the bacon and sausages, Swiss Gourmet also has a good selection of smoked meats and cold cuts that would be great for deli-style sandwiches and cold cut platters. Most of the stuff I’ve tried from them are delicious, plus, they’re reasonably priced so they’re definitely worth trying. They’re not as readily available as commercial brands, but they’re worth looking for as the products are deli-quality. DO IT FOR THE BACON! This entry was posted in food spotlight and tagged bacon, cold cuts, deli, delimeat, gaisano, gourmet, ham, hungarian, manila, philippines, sausages, schublig, schueblig, swiss gourmet. Bookmark the permalink. Ganda tlga pag natural light lang. But hopefully diffused by an overcast day or a big big window! Clap Clap Kaoko! i heart bacon! it’s my kids favorite breakfast too! i make it a point bacon is part of my weekly grocery lists. i included your page in my blogroll. rest assure i am now an avid follower of this blog. Bacon, really, is happiness. 😀 Swiss Gourmet’s smoked bacon is presented finely, on top of how yummy the bacons look. yeah! i reckon pig is the best beast in the world! the pictures are awesome too. what lens do you use? Thanks for visiting, oh fellow bacon fan! Let us worship bacon together! I’ve a feeling Anthony Bourdain agrees with you. All hail pork! (LECHON FTW!) And thanks, I usually just alternate between my kit (18-55) and a f1.8 50mm, but for this post, it’s all my 50mm. Bigla tuloy ako nagutom. hehehe A little comment sa photos.. medyo a little over exposed sa light since you ate using f/1.8.. pero it’s not bad at all. A little adjustment with photoshop or LR will do. Over all, it’s an excellent work. If you wont mind I’d love to guide Foodista readers to your post. Just add the foodista widget to the end of this post so it will appear in the Foodista pages and it’s all set, Thanks! Yay! You updated! (Last update was a month ago. T.T) My gosh, the bacon! I don’t eat pork but that’s something I’d like to stuff myself with. Beautiful food photography as usual. Thanks, I’ll keep your comments in mind.